Can’t Wait For Shabbos Book and CD! 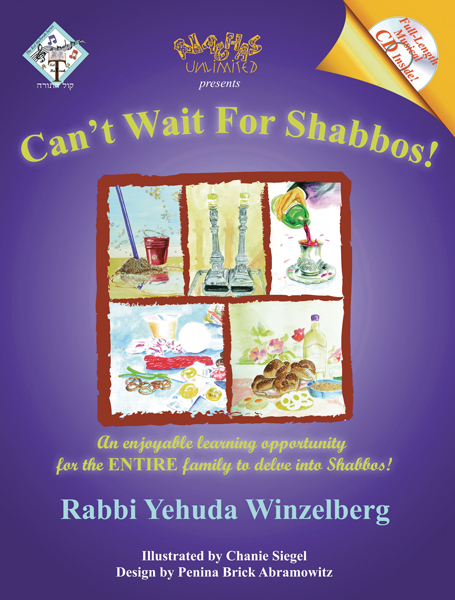 Can’t Wait For Shabbos is a wonderful new book and full-length music CD all about Shabbos. Written by Rabbi Yehuda Winzelberg, it teaches and explains by way of stories and songs about the many beautiful aspects and specialness of Shabbos Kodesh. The CD is an exciting and entertaining journey through Shabbos, with world-class music, masterfully done by Shmuli Rosenberg of SkyLine Music. The great singers that grace this album are: Shloime Dachs, Yechezkel Gluck, Yoel Dovid Goldstein, Michoel Pruzansky, Meir Sherman, Yonatan Shlagbaum, Daniel Waldman, Yosef Wartelsky, and Srully Williger. All the lyrics are based on Hilchos Shabbos, and they are fully annotated in footnotes in the sefer, where they are explained and elaborated upon through inspiring and captivating stories in each chapter. It is a veritable treasure trove of information and beautifully illustrated and designed by Chanie Siegel and Penina Brick Abromowitz. There is also a Divrei Torah section to enhance your Shabbos meals. Everything is based on the Mishnah Brurah and other prominent Torah and Halachic classics. This project enjoys praise and haskamos from Rabbonim from around the world. There is even an all encompassing glossary which makes this sefer a valuable tool for educators, as well as for kiruv. This unique project includes something for everyone and offers a rich and enjoyable learning experience for the entire family. It is sure to be enjoyed by one and all! See for yourself why more and more people are saying they just Can’t Wait For Shabbos!